Chest workout... It is not an overstatement that apart from the biceps, it is training the pectorals that most people focus on. There are multiple reasons for that: the “what’s your best bench press?” has become a major “indicator” for many people, plus this is the muscle group that is easy to check in the mirror – while the back is not, therefore its underdevelopment is not that evident, so many tend to leave that area behind. It shows from under the T-shirt too – or does so in ideal cases at least – so it grew to be a “trendy muscle”. While it would be a mistake to waste more time on this area than necessary (just think of all those doing pecs or pecs-biceps routines all week, every week), it is also a large muscle group, so it needs a hard hit to make it grow. Here you can find tips about training pecs in an “unconventional” way, and that might just be the thing to make your chest develop to a new level. This is not a mandatory method nor the only one that works – but if you like it, give it a try! It is sure to be a change compared to your current program, and that might be just the thing to reboost your development. Let’s see the exercises that target the pecs. The role of the pectorals make us include pressing motions first. These are various presses with dumbbells or barbells, and dips. Then there are the flyes: pec-deck machine, flyes with dumbbells, and cable crosses are the most effective exercises. Then you can always do pull-overs that train the pectorals from a totally different angle. You have a wide range to choose from, so why stick to one type of motions? The more angles you use to stress your muscles, the more balanced your development will be. Though there are special cases when isolation exercises (e.g. flyes) come first during workout, in most cases you should start exercises like bench presses, or inclined presses with dumbbells or barbells. After reaching the right level of tiredness, you can switch to isolation exercises, but always make sure that isolation exercises never get predominant in the program! 2 or 3 sets per exercise are definitely enough when performed at the end of the workout. There is a lot of puzzlement about it. On the one hand you’ll see a lot of guys doing enormous work on their pectorals. It is because they either read about in some professional’s workout routine or because they think that the amount of work invested is directly proportional to the results. But “more” is not the same as “better”! If you do more than 12–14 sets during a chest session, than you are likely to do it at an intensity that is too low. Working out the pecs intensively would physically hinder you from doing more sets than that – especially doing the natural way. It is even more puzzling for many! 4×8, 5×10, 6×6, 12-10-8-6, etc. – there is no end to the variations... Which one is the best? The answer: any of them can work for a while. It is a question of your physique which would work for you best. There is no set or rep count that could be perfect for everyone. So we don’t even try to convince you about the superiority of any methods listed. But we recommend you to try out a method that will surely look weird at first. This time you will do high rep-count workouts. (NOT to be confused with “cutting” workouts!) It means you go for not 12 or 15, but as high as 30 reps in your first workout set! What?! Not bench presses for starters? No, they are not! Be sure that if you want a chest that shows through your T-shirt, you need to focus on the upper regions of the pectorals, and the most effective way to do so is starting with inclined bench presses. After the warm-up sets load a weight that you think you can do 25 to 30 reps with. We cannot really tell you what this weight should be (e.g. as a percent of your 1RM) as this depends heavily on your physique. Those with a 130 kg or a 140 kg 1RM bench press will have this limit at around 80 kg (on a horizontal bench), but you need to find out for yourself. So do a set of 30 reps. Then increase the weight, and do 20 reps. Increase the load again, and do 10 reps. If you still have some juice left in you (and it is not that certain), you can do a final set of 6 to 8 reps with a slightly heavier weight. Rest time between the sets should never exceed 2 minutes. Variations – You can do the exercise with dumbbells too, or if the bench is adjustable, try to do each set at a different angle of inclination: 30°, 15°, 45° – always readjust the bench so that the direction of the load changes. The all-time favorite gets included too! As an exercise scheduled to be the second it might hurt your ego, but this kind of workout is not about the super heavy weights either, so it might not be that bad after all. It is likely that you cannot do the same as on the inclined bench, so we “take back” some load: do 3 sets of 15-20 reps at a weight that you can barely do 20 reps with in the first set, then your rep count will drop... Rest times are 2 minutes at most. Variations – You can also do the exercise using dumbbells. Pull-over exercises originally require a higher repetition count to be effective. They are the same in this program too: Go for 2×20 reps, and try not to fail, but by this time your pecs will scream for mercy, be sure about it! Rest time is 1–1.5 minutes between the sets. 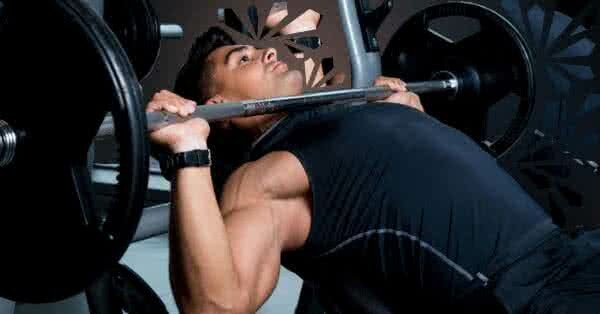 Readjust the angle of inclination between the two sets, and do 2×20 reps. Rest time is limited to 1 minute. Variations – From time to time you can do pec-deck machine flyes or cable crosses instead of flyes. More experienced athletes can do flyes in supersets with pull-overs – if they have the guts at such high rep-counts! Always keep in mind that many people think high rep-counts mean light weights – don’t fall for that! You will see that doing 30 reps at 70 kg is a pretty nasty task, but it is possible that you can do that at 80 kg (only you might suffer a bit more). Always use the heaviest manageable weights! You need to test yourself a bit to find the right weights for yourself. It is also for sure that in the first phase you can increase these loads pretty soon while keeping the rep-counts. Increase the load whenever possible! If you follow this program using weights that are too light, you might even lose muscle mass! Pay attention to the pace of the reps – tossing the weights is pointless. Each rep should be performed in good form, especially in the negative phase! As you do your reps, you will feel the urge to do the reps faster, but don’t get seduced by the dark side (via Obi-Wan Kenobi) – keep yourself to controlled motion! It is really that simple. 11 sets... Do more if you can, but keeping yourself to the rep-counts you would not really want to.